Ever since last summer, when I was very pregnant with Louisa in the heat of Arizona, I rekindled my love affair with watermelon. I always liked watermelon just fine, but that summer, I couldn't get enough. It was all I wanted, all day, every day. This summer is no exception, except that I don't have the excuse of pregnancy cravings. 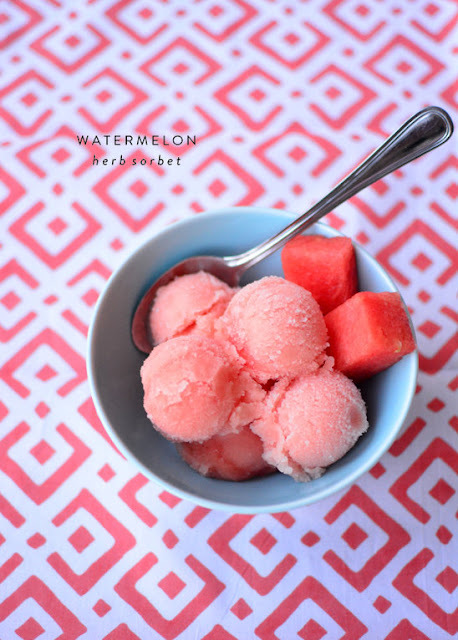 So, when my friend gave me this recipe for watermelon herb sorbet, I was like, "OK, yes. This just makes sense." It is really smooth and has the most excellent flavor from whatever herb you choose to put in it - I did basil but next time I'm trying mint! Place watermelon and half of the citrus juice in a blender. Process until smooth and transfer to a bowl. In a small sauce pan, combine remaining lemon juice, herbs, sugar, water, honey and salt. Bring to a boil over medium heat. Reduce heat and simmer for 5 minutes, stirring occasionally. Strain sugar-herb mixture into watermelon puree, cover and chill in refrigerator for 2 hours. Freeze in an ice cream maker.